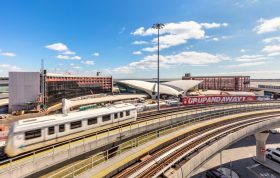 MCR and Morse Development’s repurposing of Eero Saarinen’s historic TWA Flight Center at JFK Airport into a hotel, event space and dining destination continues to move full speed ahead. The second crescent-shaped tower of the TWA Hotel officially topped out this week, nearly a year ahead of its spring 2019 opening. 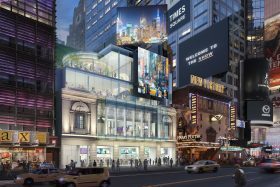 The hotel will contain 505 rooms, a rooftop pool, an observation deck, eight bars and restaurants and 50,000 square feet of event space. Saarinen’s landmarked TWA Flight Center terminal building will serve as the hotel lobby, a 200,000-square-foot space with retail, restaurants and bars. 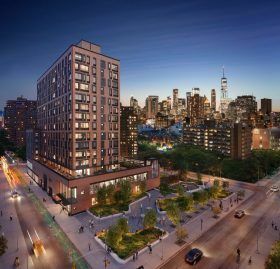 An Extell Development rental building in the East Village is now accepting applications for 50 newly constructed, middle-income units. 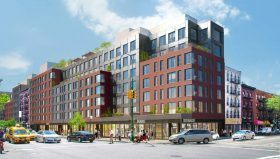 Not only does the chic building at 524 East 14th Street boast amenities like a fitness center, pool and rooftop deck, it will also have a two-level Target, the chain’s first location in the neighborhood. Qualifying New Yorkers earning 70 and 130 percent of the area median income can apply for units ranging from $1,114/studios to $2,733/month two-bedrooms. 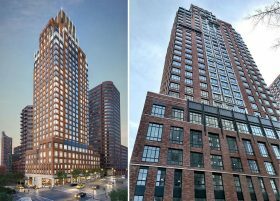 With construction wrapping up, Extell Development’s two-tower rental complex on 500 and 524 East 14th Street got new renderings this week, revealing luxury amenities and ground-floor retail, including Target, the store’s first East Village location. Opening in July, the popular chain will sit in one building of Extell Development’s complex, which was designed by Beyer Blinder Belle. According to CityRealty, the “flexible format” Target will span 9,649 square feet on the ground floor and 17,705 square feet in the cellar of 500 East 14th Street. 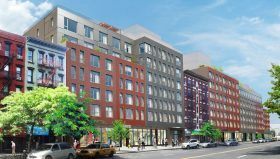 The development will also include 160 total new rental apartments, with 32 set aside for low-, moderate- and middle-income households. 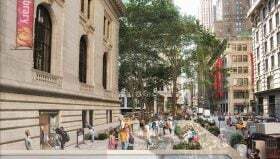 At a Board of Trustees meeting Wednesday evening, The New York Public Library revealed the $317 million master plan that will guide the renovation of the iconic Stephen A. Schwarzman Building on Fifth Avenue and 42nd Street. 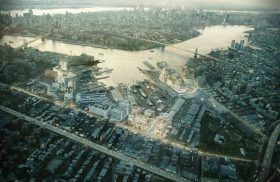 The plan was developed by Dutch architecture firm Mecanoo and the NYC-based Beyer Blinder Belle. 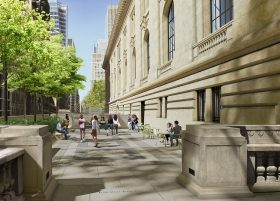 The historic Midtown Beaux-Arts building is home to one of the nation’s leading research libraries as well as historic spaces like the landmarked Rose Main Reading Room, the Maps, Periodicals, and Genealogy reading rooms, and Astor Hall.